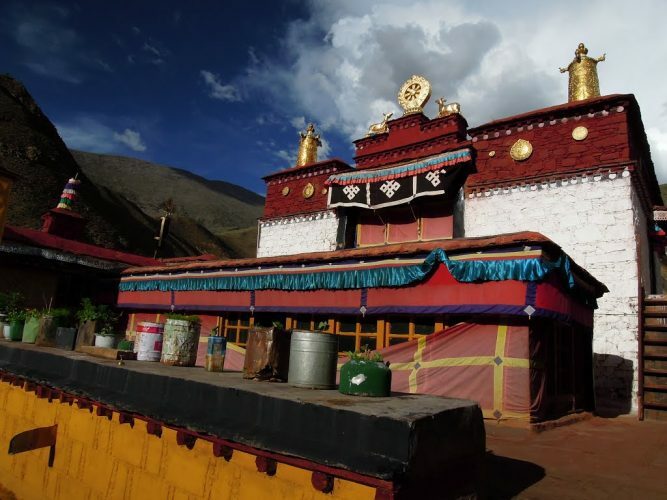 Sangphu is one of the first monasteries of the second diffusion of Buddhism in Tibet. It was founded in 1072 by Ngok Lekpé Sherab (rngog legs pa’i shes rab, 1018-1115), one of the four main disciples of Atisha (982-1054). The most significant master of this monastery has been his nephew, Ngok Loden Sherab (rngog blo ldan shes rab, 1059-1109), one of the main translators in the history of Tibet as well as the founder of one of the ten lineages of explanation (bshad brgyud). According to the Red Annals (deb ther dmar po), this monastery has been of the upmost importance in the creation of the first Shedras, Tsal Gunthang’s (tshal gung thang, Tselpa Kagyü) and Shalu’s (zhwa lu) to mention the most renowned. Regarding the connections to the Shangpa Kagyü, one of the four most important followers of Ngok Loden Sherab has been Dré Sherab Bar (‘bre shes rab ‘bar, XI-XII c.) a master of Nenyingpa Latöpa Könchok Khar (la stod pa dkon mchog mkhar, 1084-1171 ?) A close disciple of Khyungpo Naljor. Later, a master of Sangphu, Geshé Chapa Chökyi Sengé (cha pa chos kyi seng ge, 1109-1169) is mentioned alongside Shang Tsöndru Drakpa (zhang g.yu brag pa brtson ‘gru brags pa, 1122-1193, founder of the Tselpa Kagyü) in Mokshokpa’s biography. It is said that they both attended Mokchokpa’s presentation of the vision as taught by Khyungpo Naljor. A century later, at the beginning of the public transmission of Niguma’s teachings, the masters of Sangphu are said to be the main heirs of these teachings, referred to as the lineage of the one hundred and eight masters named Sengé (see The Scholar’s Feast, chos ‘byung mkhas pa’i dga’ ston).